Now that Valentine's is officially over, it is time for me to get crackin' on my daugther's first birthday party coming up in a week and a half! Remember this post when I explored my ideas for different party themes? Well, I decided to not to any of those ideas. :) About a week after I made that post, she said her first word, "dog," and ever since then, that's been her number one obsession. 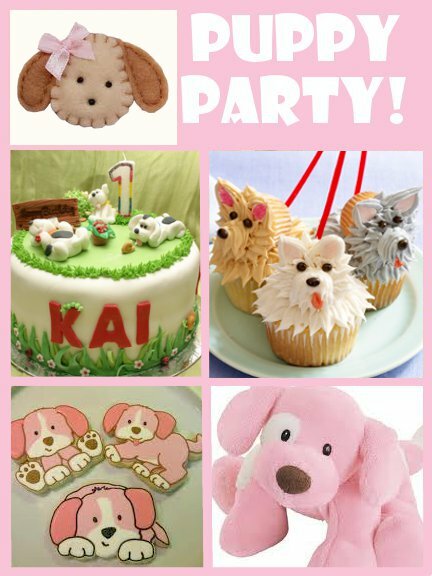 She loves dogs like I've never seen an 11-month-old love dogs before, so I've decided to throw her a Pink Puppy Party! I'm thinking I'll go with a soft baby pink, white and tan color scheme. Here's some inspiration I found. I may do paw prints every where--that'd be cute. If I can acquire a big box, I think I'll make a big cardboard "dog house"--she'd go nuts for that. Maybe some Chex "muddy buddies" or "dog food" or whatever you personally call that treat? Maybe a large puppy poster? A bunch of puppy stuffed animals? Oh, so many ideas. :) Any ideas from you readers out there? Anyone want to make her one of those adorable felt birthday party hats? :) hee hee. Naturally, I'll post pictures when the time comes! Until then, have a great day. Here's where we're linking up! SO cute!!! I love that her first birthday has a theme near and dear to her heart! We call it puppy chow at our house. And what fun inspiration. I'm amazed at those puppy cupcakes. So cute. I love puppies and would love a party like this for myself! It is an honor to have you as a follower on my blog! I'm hosting a great giveaway--all you have to do to enter is stop by & leave a comment on the giveaway post. My fingers are crossed for you. This is so cute! A friend of mine did a poodles in paris theme and she had here hubby draw a picture of a poodle the used pink foam and white pom poms to make tails and it was a pin the tail on the poodle game...really cute. You could do pin the tail on the pink puppy. Thanks for linking up! They were pretty easy! I cut a Junior Mint in half for the noses, softened tootsie rolls for the tongues and other little tricks! Good luck! That's awesome. The theme is great! The idea of a puppy party is awesome.